YOGYAKARTA- MD FEB UGM conducted survey method workshop on MD FEB UGM Building on April 26th and April 27th, 2018. There were three keynote speakers in the workshop, they were: Prof. Dr. Jogiyanto Hartono M., MBA., Ak., CMA., CA., Dr. Nurul Indarti, Sivilokonom., Cand Merc., dan Dr. Sahid Susilo Nugroho., M., Sc,. The three keynote speakers are lecturers in FEB UGM who were expert in survey-based research. 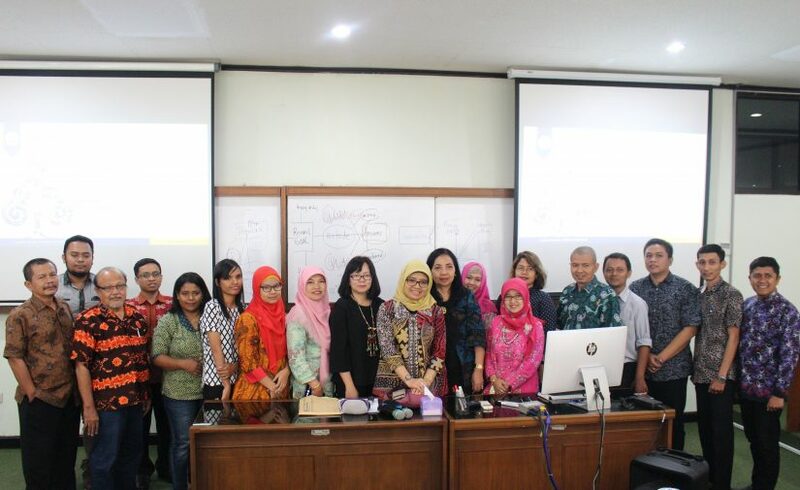 The workshop was attended by 21 participants from various higher education institution across Indonesia. The event was opened by a speech from the Director of Master of Science and Doctorate Program in Management, Dr. Nurul Indarti, Sivilokonom., Cand Merc., who was also the first keynote speaker in this workshop. In her speech, Nurul said that this workshop is one of the series of research method workshop managed by MD FEB UGM. Nurul emphasized that the first day of the workshop would be focused on basic concepts and the role of survey in business research. In the first and second session, Nurul explained the basic concepts of survey research such as the difference between quantitative and qualitative research, measurement approach in survey, survey instrument definition of validity and reliability, and the difference between formative and reflective measure. Nurul also told her experiences in conducting survey for her research projects. The workshop then entered the third and fourth session. In these sessions, the second keynote speaker, Professor Jogiyanto Hartono explained in detail about the application of survey method in business research context. He explained the process of developing, measuring and testing the survey instrument. He emphasized that the survey instrument is significantly important in survey as the instrument is the tool to measure the phenomenon which the researcher want to examine. “As the instrument is important, validity and reliability of the survey instrument must be tested first,” Jogiyanto said. The fourth and fifth session was held on the second day of the workshop. The keynote speaker for these sessions was Dr.Sahid Susilo., M.Sc. Sahid explained the validity and reliability test for research instrument by using SPSS. The topics covered in these last two sessions were: Confirmatory Factor Analysis (CFA), reliability analysis, calculation of average variance extracted (AVE) and discriminant validity analysis.